Improving Health One Delicious Bite at a Time! Visit me at Sears FitStudio! Food With Kid Appeal Jenna is one of the great mommy bloggers! Green Lite Bites Roni Noone serves up tasty dishes that the whole family will love! Hi2Mommy Follow this mama as she cooks and eats her way through the 101 Foods books! 101 Foods That Could Save Your Life – The Website! Come and see beautiful videos on some of my favorite foods from the 101 Foods That Could Save Your Life book! Cereal and Milk: It Just Fuels Right! I wish I could eat my blog. I’m not sure if creating the recipes, taste testing them, taking the photos or writing about the ingredients and their health benefits is more enjoyable than the other. Yeah, right. Eating is the most enjoyable – who are we trying to kid here? So Sharon (the wife) brought home some fingerlings to accompany some of her wonderful homemade chicken soup. I decided to pick out all of the purple ones and create a side dish that was rich in heart-healthy polyphenols. In fact, anthocyanins, the group of polyphenol plant chemicals that give these featured peruvian purple taters their color, are also responsible for giving red fruit, such as strawberries and cherries, their rich red color, too. Research has shown that anthocyanins possess a wide range of biological functions including anti-inflammatory, germ fighting and even anti-cancer activity. Besides, they also help protect blood vessels and regulate blood components that lead to plaque formation and increase the risk of heart disease. 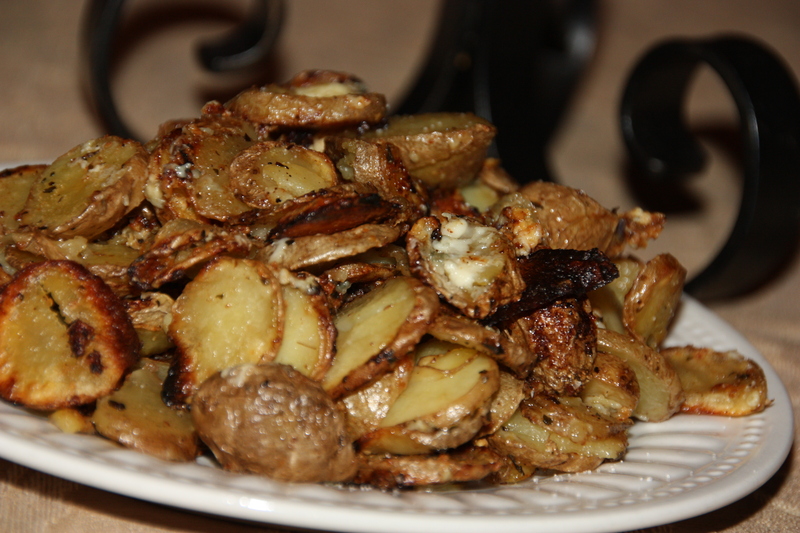 But enough already with the healthy reason of why you should eat these taters – more importantly, they taste GREAT! So let’s get cooking! 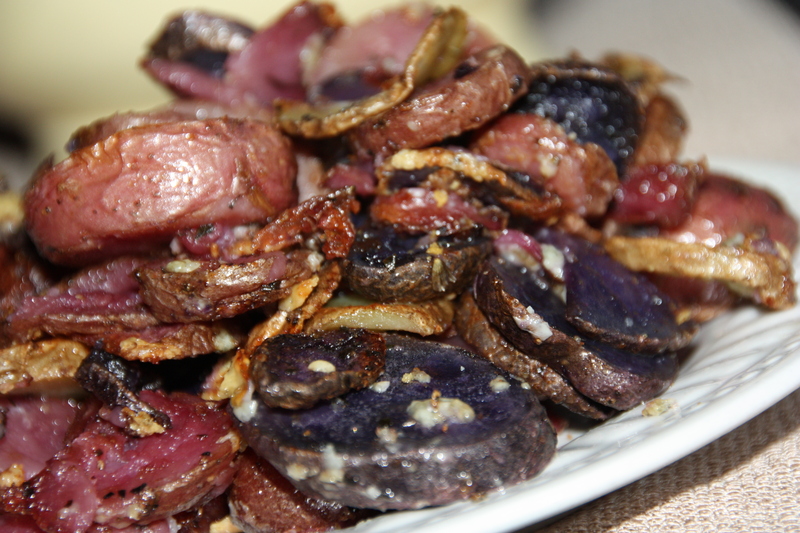 If you can’t find the purple Peruvian variety, regular fingerlings will do. Both are pictured above. Let the fun begin! Preheat oven to 425 degrees. Spray a 9×12 casserole dish with non-stick cooking spray and set aside. In a medium mixing bowl, place olive oil, pepper, salt, garlic, marsala wine and potatoes together and mix well. Remove and line the casserole dish with the potato slices. Sprinkle parmesan cheese over the top of the slices. Place in the oven. Bake for about 10-15 minutes, until slightly browned. Remove from oven and flip over potato slices. Sprinkle bleu cheese crumbles evenly over the slices and return to the over until well-browned and the cheese has melted – about 10-15 more minutes. Serve and enjoy! Hit me up in the comment section and let me know what you think!